Your conference furniture often defines the first impression your clients receive as they meet with your associates. Your conference furniture needs to be stylish and highly functional for your clients and associates. Other factors that need to be considered are the ever changing technology demands like videoconferencing, webinars, and multi-media presentations. 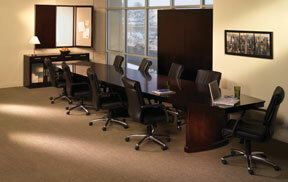 Your conference furniture can greatly improve the dynamic of your meetings and your productivity. The space and size constraints of your room are the first things to look for when designing the layout of your conference furniture. You want to make sure that the space around the table will adequately allow for activities to run smoothly in the rooms that you plan to put the conference furniture. Your next consideration is style, which will run you from modern to traditional in terms of tables as well as from wood finishes to laminates. Take a look at our broad range of conference furniture. We are confident the quality and value we offer will exceed your expectations. Mayline Hennessy - This conference furniture is unmatched in the industry when factoring beauty, craftsmanship, and affordability. Hand-selected North American cherry veneers combine with intricate walnut inlays in a Dark Cherry finish creating a stunning result. Even the most discriminating client will find Hennessy appropriate for their executive conference rooms. The Hennessy handcrafted conference table and matching accessories feature Cherry veneer with a Dark Cherry finish. Walnut inlays on work surfaces and bases match the buffet credenza. Complimenting the extensive offering of conference tables are a selection of buffets, credenzas, and presentation boards. Mayline Napoli - These wood veneer conference tables feature elegant lines with excellent durability. Available in three rich finishes, REAL Surfaces: Sierra Cherry finish on cherry veneer, Mahogany finish on walnut veneer, and Golden Cherry finish on beech veneer. Stainless Steel privacy panel along center beam. The conference tables feature AA-grade select North American hardwood veneers throughout. All veneer surfaces are protected with two coats of high-tech catalyzed lacquer. Mayline Corsica - These wood veneer conference tables and matching furniture feature elegant lines with excellent durability. Available in three rich finishes. 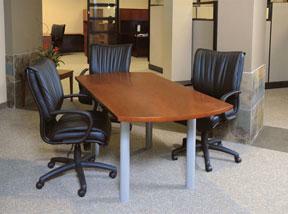 This office furniture features AA-grade select North American hardwood veneers throught. The conference tables have an all veneer surface that is protected with two coats of high-tech catalyzed lacquer. 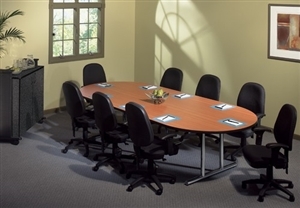 Mayline Sorrento - These wood veneer conference tables are a transitional line of conference room furniture. This line combines a high-end look with technology-friendly features. 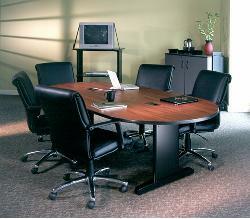 Each conference table has a high end look with technology-friendly features. The Sorrento conference tables and matching furniture is available in either a Bourbon Cherry finish or an Espresso Walnut. 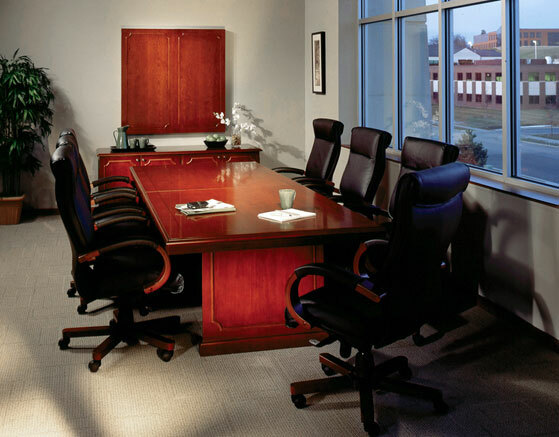 All conference tables use AA-grade North American Hardwood veneers. Mayline Accorde - These conference tables are designed for optional power and data access to operate computers and presentation equipment during meetings. Unique to the design are the options of two stylishly designed legs, Premier and Slimline, each with their own appeal. Your conference room has been transformed into the decision-making center of your organization. Mayline Toscana - These wood veneer conference tables feature elegant lines with excellent durability. Available in two rich finishes. 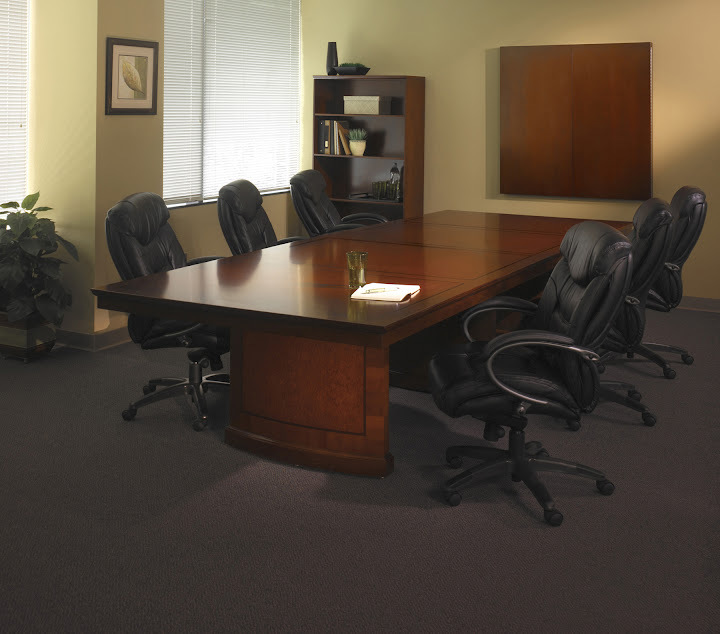 This conference room furniture features AA-grade select North American hardwood veneers. All veneer surfaces are protected with two coats of high-tech catalyzed lacquer. Mayline AVA Luminary - These conference tables have an assortment of matching desk configurations lateral files, bookcases, cabinets, white boards etc. allowing you flexibility as you furnish your conference room. Luminary features top grade North American maple and cherry veneers. Each piece undergoes a 19 step finishing process and a filled pore catalyzed lacquer finish. The result is simply beautiful and will provide you with many years of durable performance. LUMINARY is an in stock line which is designed to serve your needs, today. Mayline Geneva - These full-size conference tables feature a sturdy tubular steel base with a high-pressure laminate surface. Three shapes of conference table surfaces: Racetrack, Boat, and Rectangular. Two shapes of occasional surfaces: Full Round and 3-Sided. Heavy gauge tubular steel bases available in both Chrome and Black. High pressure laminate surfaces with durable T-mold edge. Mayline AVA Mira - These conference tables offer freedom and flexibility in the design of your conference room. Featuring a hardwood edge, table tops of 1-1/2" thickness, and the finest grade North American veneers, the Mira Series provides an elegant and classy look. When designing an office interior for maximum performance, versatility and style, take a close look at Mira's cabinets and presentation boards. The Mira conference table is functional and beautiful, affordable and always available. Mayline AVA Eclipse - These conference tables series offer freedom and flexibility in the design of your conference room. Featuring hardwood edges, worksurface tops of 1-1/8" thickness, and the finest grade North American veneers. ECLIPSE is stocked in the Espresso Walnut (EW) and Warm Cherry (WC) finishes. The ECLIPSE conference table series provides a contemporary look and feel by featuring floating worksurfaces, metal modesty panels and a clean bevel edge. 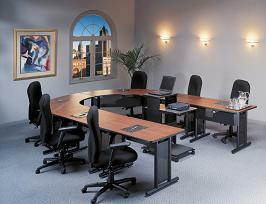 Mayline Aberdeen - These conference tables provide a simple, elegant and functional desigh. The Aberdeen series is an all-laminate line of office furniture that offers an extensive range of products designed to complement today¥Ë_s executive environments. Its durable 1 5/8" thick surfaces, vertical grain modesty panels and distinctive fluted edge detail express an aesthetic appeal that speaks of success. Multiple storage and pedestal options support your organizational aspects and at the same time, fulfill the functional requirements of technology, such as extensive cable management and pencil drawers that can be converted for laptop use. Mayline Meeting Plus - When the image of your meeting room and training room reflects the high standards of your business, select Meeting Plus. Blending contemporary design with uncompromising durability, Meeting Plus style and construction will adhere to your meeting and training environments. 16-gauge steel frames and high-pressure laminate work-surfaces connect easily using threaded steel inserts making installation a snap. A selection of four shapes in multiple sizes lets you set up and reconfigure your meeting and training rooms in several configurations. The Meeting Plus conference tables have been redesigned to include two new important features: Cable management and mobility. Mayline Brighton - Unlike most value-priced laminate lines, the Brighton conference tables are backed by a limited lifetime warranty ensuring years of lasting beauty in any office. When time is of the essence, same day shipment is available with Mayline's program. The entire Brighton Series is fully stocked in all of Mayline's distribution centers allowing complete Brighton offices to be delivered literally next-day to many locations.